Chongqing is a big city with character. It is located in central China 150 mi/240 km southeast of Chengdu. In contrast to many of China's flat, uniformly gray cities, Chongqing (pronounced chong-CHING) is on the hilly banks of the Yangtze. Enjoy just walking the streets (lined with sculpted wood balconies) and spending time on the active docks. Among Chongqing's attractions are the Sichuan Fine Arts Institute (an artists colony), a lacquerware factory and hot springs. There are several museums commemorating postrevolutionary events, including the Hongyan Revolutionary Memorial Hall and the U.S.-Chiang Kai-shek Criminal Acts Exhibition Hall, complete with displays of torture instruments. (Chongqing was the wartime capital of Chiang Kai-shek.) Pipa Shan Park, the highest point in the area (682 ft/208 m), has a pleasant view. Chongqing is among the world's fastest-growing cities. Its entire municipal area covers about 50,000 sq mi/129,500 sq km—about the size of Austria or four times bigger than El Salvador—and its population is about 32 million people. 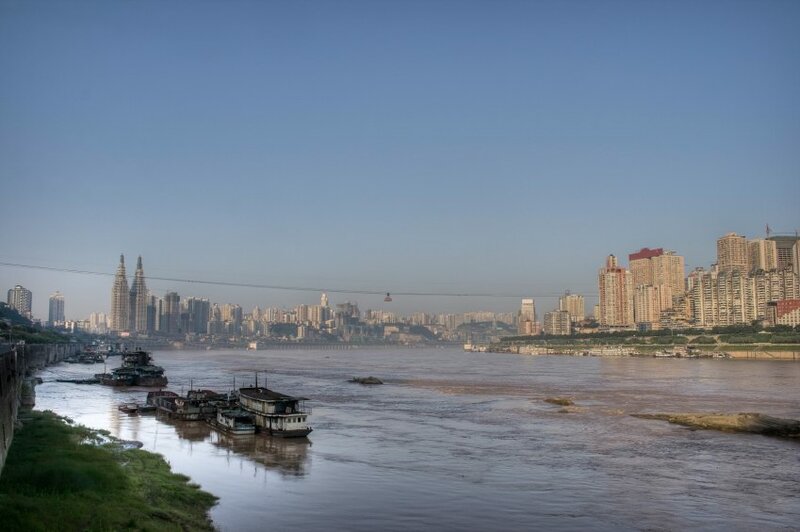 By 2020, up to 50 million people will live in greater Chongqing. Since 1997, Chongqing has functioned as a municipality directly administered by the central government, like Beijing, Shanghai and Tianjin, and is no longer governed as part of Sichuan province. A decade later, the city became become central to a Chinese political drama, when British businessman Neil Hayward was found dead in his Chonqing hotel room. Hayward was later found to have been poisoned by Bo's wife, Gu Kailai, as part of a business deal gone wrong; Bo was later jailed for using his position to cover up her crime while embezzling funds and accepting millions of dollars in bribes. Seen by many as the victim of a political purge (as bribes are par for the course in China), the ruling remains a spectacular fall from grace for one of China's ruling elites. Yet, most people beyond its parameters know little about this city that was China's World War II capital and is now focused on a more prosperous future. Chongqing is a key pillar of China's nationwide urban development program, and—along with Beijing, Shanghai and Tianjin—is one of only four city municipalities in the whole country. Typically, visitors arrive by overnight train, en route from visiting the Terracotta Warriors in Xi'an. They spend less than a day in Chongqing before boarding a cruise ship down the mighty Yangtze River to the fabled Three Gorges. Such a short stay is a shame, as Chongqing is one of China's most intriguing cities, and its spicy local food is outstanding. The city is home to several interesting museums, and the panda room at the Chongqing Zoo allows visitors to get up close and personal with China's famous bear. Built into the hills meandering across a steep river valley, Chongqing overlooks a cavernous basin where the muddy Yangtze and Jialing rivers converge. Unlike most flat Chinese cities, its hilly topography affords fabulous views. From the riverside wooden deck terrace at Hong Ya Dong—a 10-level hillside development of old-style cafes, bars and a hotel—Chongqing seemingly stretches beyond the horizon. To the east, west, north and south, high-rise construction is the dominant impression. Many restaurants overlook the Yangtze from the riverbanks. At ground level, however, Chongqing is a green city, with several parks and public spaces and tree-lined streets. There are no cyclists, and the taxis and buses run on liquefied natural gas. Motorcycles are ubiquitous, and the jovial red-helmeted motorbike-taxi drivers add character to the city. Chongqing's 21st-century skyline is changing fast, and moving upward. Much of the downtown area is cloaked in skyscrapers, and the second-tallest building is a replica of the Empire State Building: its name—written in Chinese characters—is "New York, New York." The nearby Liberation Square (the large central monument dedicated to the World War II defeat of Japan was the first of its kind erected in post-war China) features glassy shopping malls, cafes and office towers. Despite the charms of Chongqing, most travelers go there as part of a trip to Dazu, known for its Buddhist sculptures. Set in a mountainous and green area, Dazu was not open to travelers until 1982. Today you'll find an impressive reclining Buddha and thousands of stone carvings, some dating from the ninth century.